If you're a teenager living in North Carolina and you want to get a job, where do you start? It can be helpful to first understand the child labor laws in the state so you're even sure whether you can work there. Each state's laws can be somewhat different, so if your family recently moved from Ohio, it doesn't necessarily mean that you can also work in North Carolina simply because you had a job before you moved. How Old Do You Have to Be to Work in North Carolina? You can begin working in North Carolina when you're 14 years old, but you must have a child employment certificate to do so. You can obtain an employment certificate from the Department of Labor or your county's Social Services office. Fourteen is the same age that federal law sets as the minimum age to work, although there are some exceptions. When there's a conflict between federal and state laws, the more restrictive law will apply, but that's not an issue in North Carolina because the minimum age is the same. When Can a 14-Year-Old Work? Although North Carolina does allow a 14-year-old to work, the state does treat some teens differently depending on exactly how old they are. For example, 14- and 15-year-olds can work up to three hours on school days and up to eight hours on non-school days, but they're prohibited from working more than 18 hours during weeks when school is in session or more than 40 hours during weeks when school is out. They must also work between 7 a.m. and 7 p.m. except during summers when they can work until 9 p.m. The Wage-Hour Act dictates that at a minimum, teens under the age of 16 must be given a 30-minute break after they've worked for five consecutive hours. Juveniles cannot hold jobs that are considered hazardous, such as most manufacturing jobs or in jobs that expose them to toxic chemicals or other dangerous substances or working conditions. Teens in the 16- to 17-year-old age group have a bit more flexibility when it comes to working hours, but they generally can't work between the hours of 11 p.m. and 5 a.m. if school is in session that day. In other words, they can't clock out at work at 5 a.m. and head off to school a few hours later. They can't clock out at midnight if they have school the next day. With parental permission and with permission from a school administrator, however, this restriction can sometimes be waived. 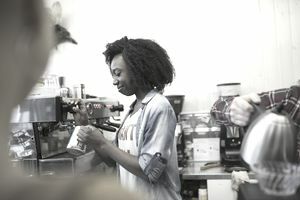 Older teens are typically also prohibited from working under dangerous conditions and in hazardous jobs, but there are exceptions. For example, teens who participate in programs that are defined as apprenticeships by the Fair Labor Standards Act may be able to work in hazardous fields that are normally off limits to youths. Discuss your options with your potential employer or with a North Carolina child labor authority, or visit the North Carolina State Labor website.